The hours are flexible enough that I can teach online and also have time to homeschool. It’s just about perfect! 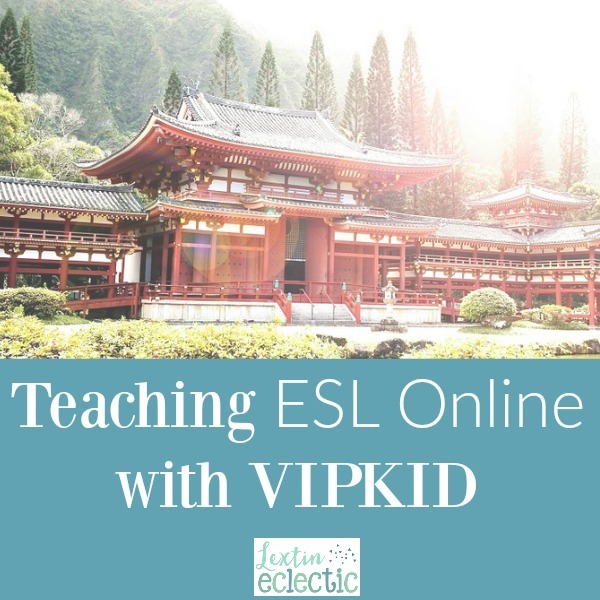 Here’s an overview of VIPKID! VIPKID offers 1-to-1 English lessons to kids in China and in other countries around the world. The curriculum has 7 levels and students are from ages 3-13. Each lesson is 25 minutes and the materials are already prepared for you. For each lesson, you have a set of PowerPoint slides to use as you teach. After each lesson, you provide feedback to the student’s parents about the lesson and ways they can improve. Parents are also able to rate you as a teacher and provide feedback on the lesson. You are hired at a base pay rate. After that you will go through 1-2 mock class teaching experiences – you will be teaching a VIPKID teacher who pretends to be a student. You will receive feedback on your teaching techniques. If you pass all these stages, then you will be able to sign a 6-month contract and will upload your bio, intro video, and pictures to their website. Once you have signed your contract you are able to open your available timeslots several weeks in advance. Parents look through profiles of teachers and choose teachers based on your bio, intro video, and teaching experience. It can take a while to get bookings in the beginning, so the first few months might be a bit slow as you wait for parents to book with you and leave reviews. Trial classes are booked by staff in the head office, so you may begin your time with VIPKID teaching a lot of trial classes. Some of these students may sign up and continue to book classes with you. And if you’re interested in teaching with VIPKID, you can visit their website to learn more or to apply!